This Rolo Pastry Braid is dangerously easy to make! 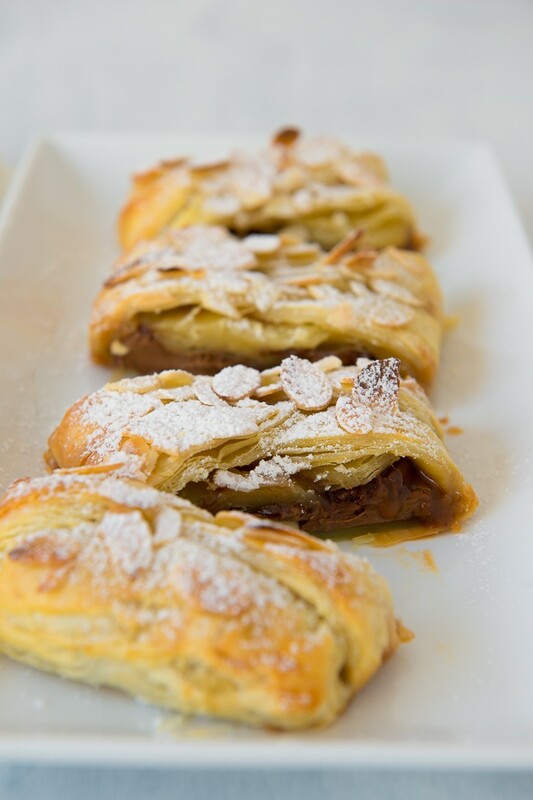 Essentially it is just a slab of chocolate, wrapped in puff pastry and sprinkled with almonds and baked. Easy, huh? If you are a fan of chocolate and caramel together, then I’m guessing you love Rolo’s as much as I do. You can now buy Rolo’s in chocolate slab form, which worked out wonderfully for me in making this dessert. The chocolate and caramel melt together when baked, making the most ooey gooey, delicious filling. However, you could really use any slab of chocolate you like! Defrost your pastry overnight in the fridge. Preheat your oven to 200°C. Grease and line a baking tray and unroll the pastry onto the baking tray. Place the Rolo slab in the centre of the puff pastry sheet, leaving about 3cm of pastry above and below the Rolo slab. Use a sharp knife to make 4 cuts in the pastry where each of the chocolate slab corners are. The cuts should be from the edge of the pastry to the very corners of the chocolate slab. Cut strips of pastry on either side of the slab at a diagonal angle, about 1-2cm wide (but keep them all the same size!). Remove the 4 pieces of pastry at the corners. 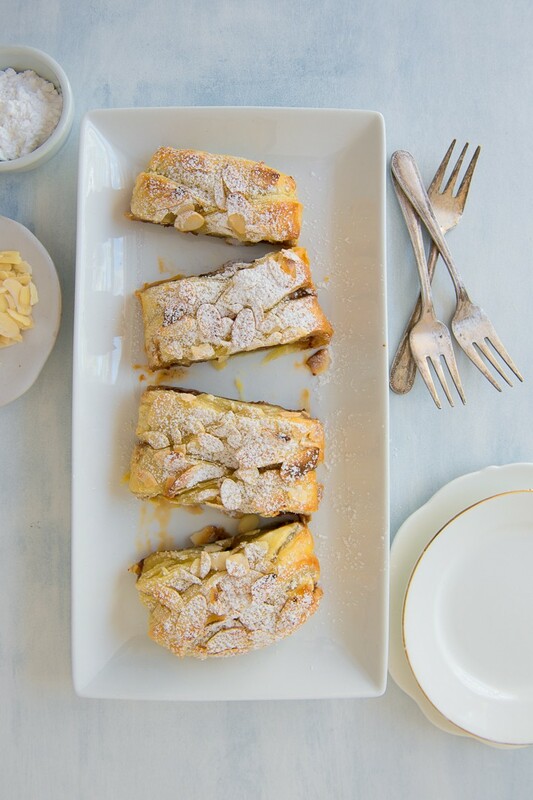 Fold the top and bottom rectangles of pastry onto the slab. Now fold alternate strips of pastry across the Rolo slab in a criss-cross motion to create the braid effect. 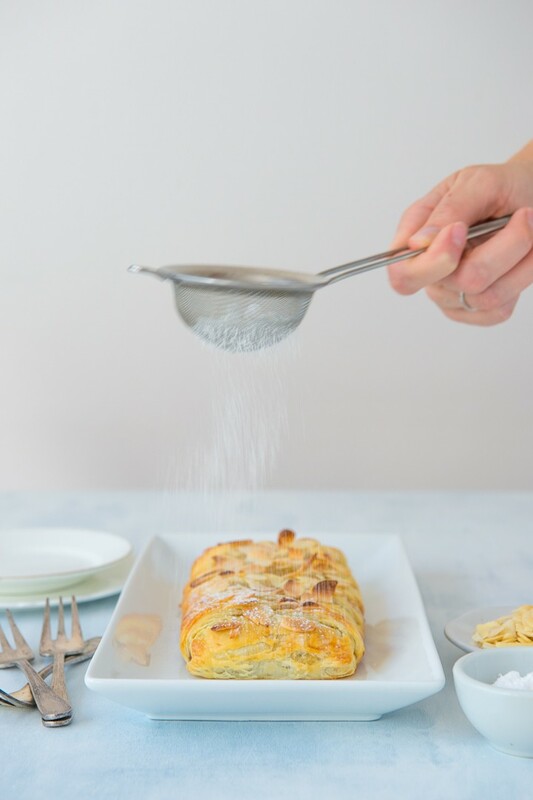 Brush some beaten egg over the entire surface of the pastry then sprinkle over the flaked almonds. Bake for 20-25 minutes, or until the pastry is golden. Leave the pastry braid to cool on the tray for about 10 minutes, then dust with icing sugar and serve.